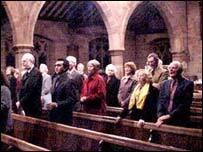 Churches and chapels across north Wales have been targeted by thieves in a series of raids. 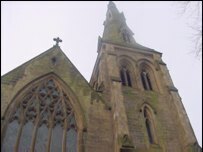 More than 20 places of worship have been hit in the break-ins across Denbighshire and Conwy in the last two months. In one of the latest raids antiques were stolen from St Mary's Church Hall in Betws-y-Coed, Gwynedd. However, police believe the thieves are trying to target the churches collection plates. "In the majority of cases the offenders have smashed windows at the back or at the side of properties to gain entry to the buildings," said Ifan Hughes from North Wales Police. "Once inside they have stolen property then left - leaving a trail of destruction in their wake. "In some instances the offender or offenders have left empty-handed and in others they have stolen collection money." In recent years a number of clergymen have taken the decision to lock their church doors outside specific times of worship. However, recent research by Ecclesiastical Insurance - the group which insures the majority of churches and chapels in Wales has discovered that the buildings and their contents are safer when left open. "If a church is left open there's a chance that somebody can be disturbed," said John Winton from Church Tourism Network Wales. "It's being sensible and taking precautions, ask neighbours to walk their dogs and drop-in," he added. Some of the churches and chapels have been repeatedly targeted. In Corwen, offenders have targeted a religious building in the town six times since May. In Llandudno places of worship were broken into five times since January and in Abergele, Mynydd Seion Chapel was burgled twice in June alone. In January a burglar who raided safes and charity boxes in more than 500 churches across Wales and England was sent to prison for four years. Swansea Crown Court heard that Christopher Coulthard, 40, checked out the churches dressed as a tourist and carried his tools in a camera bag. He was finally caught in Aberystwyth last September after a local cleric reported him to police.